There’s an enchanted quality to this placement of greenery, as if delicate plants are spilling in from the chimney. First check to see that your fireplacegets at least a little bit of sun. Then shop the garden center (or your house) for about a dozen low-light plants—ferns and mosses are perfect—and nice-looking terra-cotta pots of different heights and shapes. Use a stump (again, at the garden center) or a stool to elevate one plant. Turn over spare pots to serve as stands for others, creating a sense of organic randomness through varied levels. 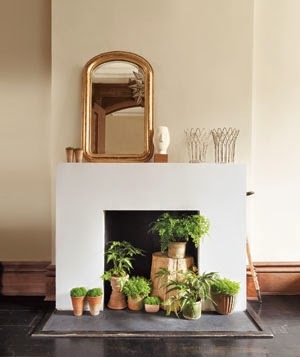 Place some plants inside the fireplace opening, with others inching out and a few flanking the opening. Matched pairs pull the look together. Leave some blank space, rather than filling every inch. The intricate leaves can be appreciated (and watering is easier) with a little air around them.